Non-Stop 3D Car Cartoons Featuring Monster Trucks, Race Cars, And Friends! These 3D cartoon cars want you to join them on their adventures as they drive through the city with their friends. 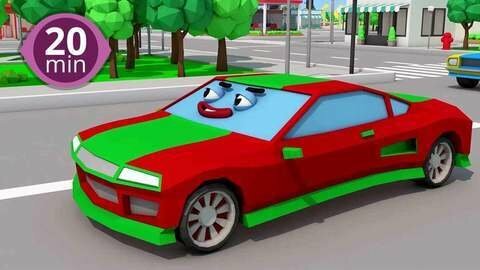 In these non-stop videos of 3D car cartoons, you can watch multiple episodes in one video! These 3D cars are always driving around non-stop. You see, these silly 3D cartoon cars live in an eventful city. You’ll love watching these colourful 3D cartoon cars, police cars, evacuators, fire trucks, tow trucks, bus, and other friends work together to repair the roads and each other. Seeziskids features 3D car cartoons for kids about naughty cars racing around, tow trucks helping out, and police cars dealing out justice.Get your wheels ready and come join these amazing 3D cars on their nonstop adventures with the cop cars, monster trucks and their friends. New 3D cartoons about cars non-stop are entertaining and educational at the same time! They have everything you love about our car cartoons – your favorite characters, funny and sometimes dangerous situations, and important life lessons. They also teach kids to help each other, work as a team and make friends. So join us and watch all episodes of the Cars for Kids cartoons online for free at SeeZisKids!